Praveen Siddannavar's Blog: The World in Her Stride! A day that I will never forget, a moment that will be cherished until my last breath. 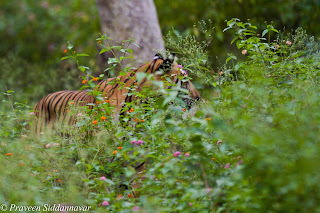 Many of us have seen tigers in the wild, but I had completely a different experience on 21st Aug'2010. I was put at Jungle Lodges and Resorts, Bandipur. 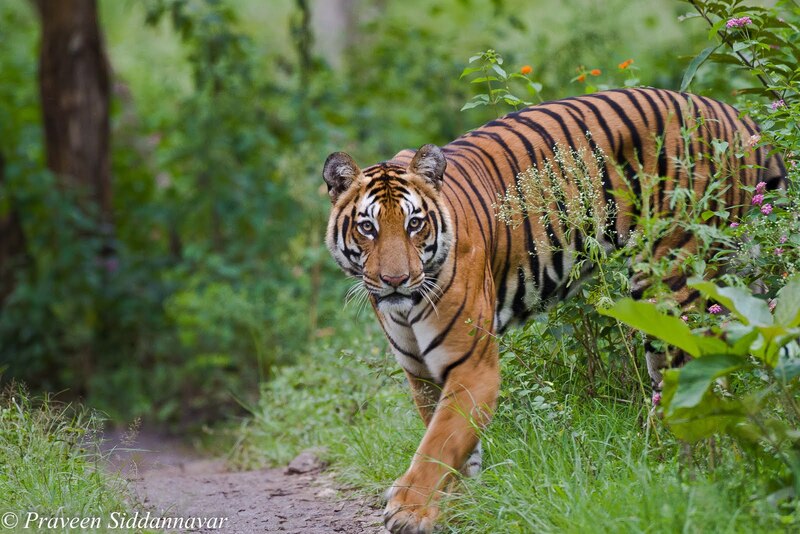 I was excited to hear about a kill made by a tiger around the Kadamattur Katte area. My evening safari ride had begun and this time I didn’t have to tell anything to my driver kiran, he had already made plans to go in search of this tiger around the area where it made the kill. We started quite early at 3:45pm, it had rained heavily on the previous day and the forest was flooded but it looked so beautiful with lush green leaves on trees and lantana had its colorful flowers. 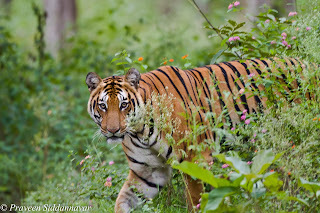 We drove around the KM Katte area several times, no sign of, leave aside the tiger we didn’t even spot any other animals except for few spotted deers. With cloud cover and drizzle all through our journey we reached the anti-poaching camp at about 5:30pm, the forest guard over there said he didn’t see any tiger for past few days nor did he hear any alarm calls. 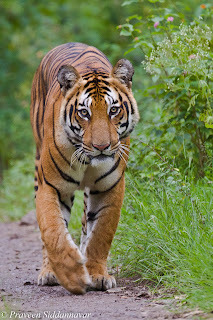 But we had confirmed information about the kill, normally if a tiger makes a kill its movement is around the same area & in this case the tiger killed a Gaur, gaurs are huge weigh over 1000kgs and the tiger can't consume this for several weeks and it has been recorded that even an adult tiger will not be able to consume even 50% of the Gaur meat. In our jeep we also had a family that were from Bangalore & it was their first trip to Bandipur, they seemed quite frustrated not that we didn’t see a tiger but no sighting of any animals. However I shared few of my experiences on Bandipur and kept their moral high. It was almost 6pm the light was fading and the park gates were about to close so we started heading back to the exit gate, I and Kiran said let’s take one last chance & take the route of Kadamattur Katte. The track was very narrow with thick bushes on both sides especially with the lantana. 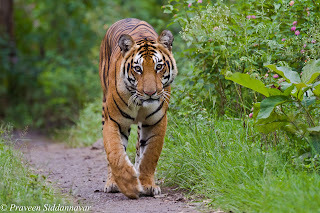 I was in the front seat along with kiran and suddenly at distance we saw a tiger that took a huge leap from our left to right, it was so quick that others didn’t even notice and could not believe us. I asked kiran to stop the jeep and switch off the engine; the langurs on the tree noticed the tiger in the bush and gave alarms calls. By now we could just see part of the tiger’s body and head in the bush. I noticed that it was staring at us and I quickly realized that the tiger didn’t have a passage to go into the bushes because of the thick lantana. I asked kiran to reverse the jeep a bit, with the hope that tiger will come out. 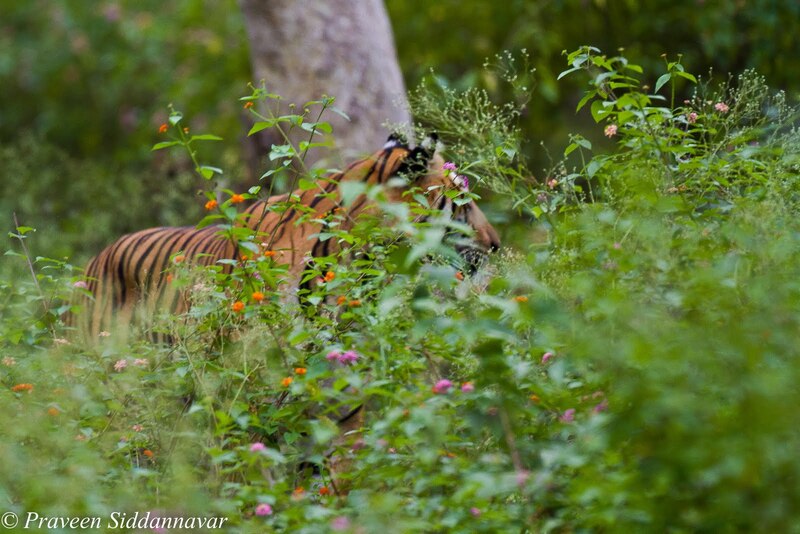 I guessed it rightly & couldn’t believe that the tiger was just about to come out of the bush. I didn’t want to miss the opportunity to photograph but my position/angle was not ideal I was in front seat with no opening above me and photographing through the wind shield glass was the last thing I wanted. I requested kiran to reverse a jeep a bit more and park it in an angle such that I am able to shoot from my windown with bean bag support, he did it to perfection. I was all set & the tiger started to move out and I was in direct eye contact with the tiger, I was nervous but kept the focus points on the tigers eye/head area and started to shoot in burst mode. Due to low light my shutter speed was hardly 1/50 sec and I had no time to change the settings, I continued to shoot. The tiger was staring at me & continued to walk slowly towards me I didn’t move and kept clicking. What a moment it was, call it face to face or head-on, the distance between me and the tiger was less than 50 feet, the family that were seated in the jeep were so scared that they closed the windows and in the excitement they didn’t click a single image. As the tiger got even closer, the group seated at the rear screamed. From a sudden silence there was so much noise that the tiger that was heading towards our jeep changed its direction and walked on our right side again in the bush. It didn’t have any other way so it was patiently waiting in the bush. The time was almost 6:30pm and normally the forest officials starting closing the exit gates. So we had to leave the tiger in the bush and move on. 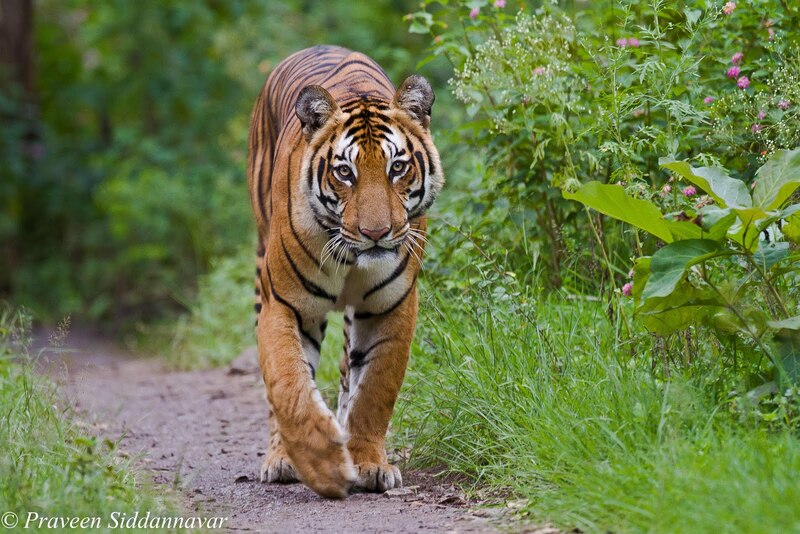 Friends believe me it is a lifetime opportunity for me to face a tiger so close & head-on. By far this was one of my best ever moment that I ever had; I felt I had complete control on the tiger movements & felt I was on top of the world. 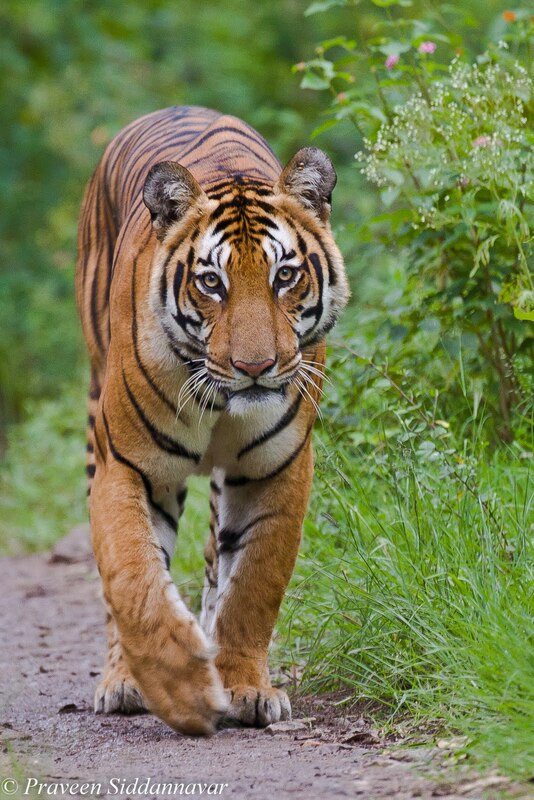 Even now as I am narrating this incident my hands are shivering, I can’t believe that I could face a tiger so close. A dream come true and surely some dream shots. 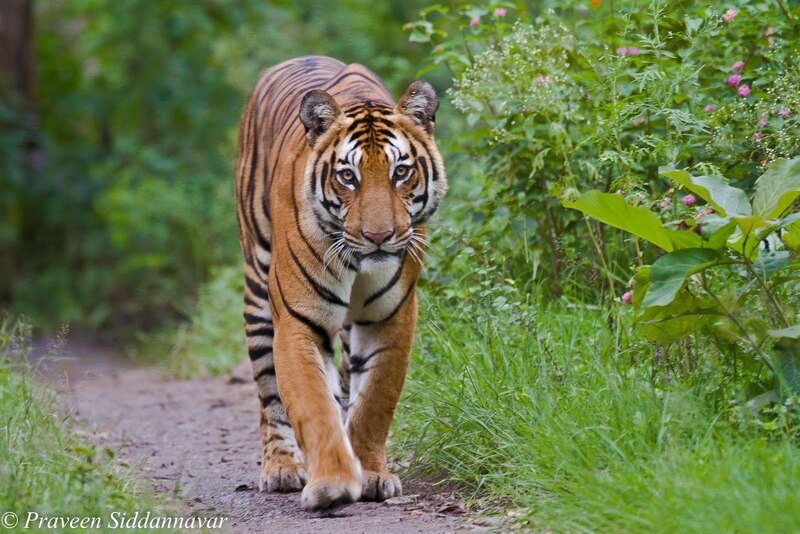 Very good account of an encounter with a tiger.